Los Angeles International Airport (LAX) pick up. * Pick-up service tip: $4/person/way. Departure from Los Angeles in the morning, along with San Bernardino Mountains and enter Mojave Desert, the largest continental desert in North America. The boundless land is decorated by bizarre-shaped Joshua trees and yucca plants. You will make a brief stop at Tanger .And then head to Las Vegas - “the entertainment capital of the world”. We enjoy lunch there by your own. Las Vegas Night Tour (Optional): See the bright lights of Las Vegas and visit the hottest spots in the city on this 3-hour amazing tour. Stop by the Mirage volcano, Bellagio Fountains and much more! You'll see the ever-popular Fremont Street Experience - a spectacular show of millions of LED lights and 555,000 watts of sound over five blocks on Fremont Street. West Rim (Skywalk) (VGC): Over eons, the Colorado River and erosion have sculpted this amazing landscape. Grand Canyon west rim belongs to Indian Reservation. The group will take the designated park shuttle to enter the canyon. Upon arriving in the terminal, you may take the helicopter ride and sightseeing boat tour (Optional), in order to feel the canyon and Colorado River from different perspective and explore the true beauty of the Grand Canyon. Afterwards, you may take the park shuttle to the next sightseeing spots, Eagle Point and Guano Point. At Eagle Point, you may take an optional visit to the "Skywalk", which is the new gigantic construction built on the very edge of the Grand Canyon West Rim. The group will return to Las Vegas in the evening. You may watch the world’s renowned show at your own cost (optional). Customers who participate in this trip should pay the entrance fee. South Rim (GCN): Here is the world's most vivid erosion model, which is why the Grand Canyon has not only become a textbook for the geologist and paleontologist, but also made the millions of tourists each year filled with emotion when they face the masterpiece of creator. You may watch the IMAX movie of the history of Grand Canyon at the entrance at your own cost. Then, go to the largest view point near visitor center - Mather Point. If God is the creator of the Grand Canyon, Colorado River is an artist who has carved the Grand Canyon. Despite the passion in summer and the cold in winter, the river and valley’s history of romance has been going on for six hundred million years long. Sunshine and clouds are always alternating controls over the canyon, adding a dash of style to the magnificent scenic picture. The group will return to Las Vegas in the evening. You may watch the world’s renowned show at your own cost (optional). 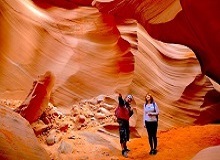 Antelope Canyon and Horseshoe Bend (VAC), which is one of the world's ten photography site. We will travel across Glen Canyon Dam of North America's second largest man-made lake, Lake Mead. 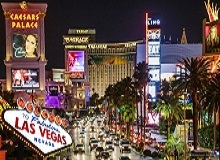 We'll then The optional city tour of Las Vegas and explore the "Entertainment Capital of the World" or attend one of the unique shows that are exclusively performed in Las Vegas. In the morning, visit Ethel M Chocolate Factory and Botanical Cactus Gardens outside of The Strip. You can see chocolates being made, sample gourmet treats and meander through the maze of paths at the Botanical Cactus Gardens at no charge. Be sure to sample a piece of fresh made chocolate! After having lunch in Las Vegas, the group heads back to Los Angeles. Stop by Outlets Center for short rest before continuing to Los Angeles. Arrive in Los Angeles in the evening for a wonderful conclusion of the trip. After, guests will be dropped off at the major pick-up locations. The tour normally returns to Los Angeles between 6:30 pm - 7:00 pm, but there may be a 30-60 minute delay caused by circumstances such as bad weather and traffic. Guests who wish to end their tour in Las Vegas, must please leave us a note under the comments section when completing their reservation. Guests who choose to end their tour in Las Vegas will not be able to visit the Tanger Outlets, but they will be allowed to visit the Ethel M. Chocolate Factory and Botanical Cactus Gardens in the morning and enjoy the optional buffet brunch in Las Vegas. They will then later be transferred to the MGM Grand Hotel and Casino, near McCarran International Airport. 9. Optional items and extensional tours during the trip.